Many anglers forget that regardless of the quality of the tackle they purchase, reels and rods must be properly maintained and serviced to ensure optimum performance. Without this care, even the finest equipment can quickly be rendered unusable by the harsh marine environment. By following a few simple steps on a regular basis, you can make sure your tackle will be up to the task when that oversized gamefish decides to put it to the test. Penn offers these suggestions to help keep your tackle in top fighting condition. 1) After fishing in salt water, gently rinse or wipe off your reels and rods with fresh water. Do not use a powerful stream of water if rinsing your reels with a hose ­ doing so will only drive salt particles and impurities into the internal mechanisms. 2) Some anglers will apply a soapy solution prior to rinsing off reels and rods, especially after extended saltwater use. A soapy solution of Simple Green, Dawn or an equivalent cleaner will help dissolve the build-up of salt crystals. You can use a soft cloth to help remove any scales stuck on your rods. Do not abrasive scrub cloths or sponges, as this may damage the rod finish. To help preserve that new rod luster, apply and wipe off a furniture polish (such as Pledge) periodically. 3) Dry reels (and rods) with a chamois or terry cloth towel, or let them drip dry. Then apply a coating of protective oil, such as CRC or WD-40 to your reels. When spraying protective oil on your reels, be careful not to spray your line. If you do, be sure to wipe it off right away. 4) Periodically, apply Penn lube to oil ports on handle knobs, outside frictional surfaces (under eccentric lever, etc.). Resist the temptation to apply too much lubrication. Remember, it's better to lubricate sparsely and often. Don't try to make up for a lack of regular in-field maintenance by "over-lubricating." 5) Penn's tubes of reel lube are just the ticket for lubricating oil points and other frictional surfaces. Use a quality grease, such as Penn's Muscle Grease for gear teeth, bearings and other internal frictional surfaces. 6) Store your reels and rods in a cool, dry place and remember to back off the drag (lever, star or knob) on your reels to keep pressure off the drag springs and to allow the drag washers to more quickly. Tip: On International and star drag reels, put the clicker on after backing off the drag. This will prevent line from coming off the spool too easily. Do not store reels in plastic bags as condensation may develop. 7) Depending upon use, reels should be periodically taken apart and serviced. A good general rule of thumb is to do so at least once a season ­ more often if tackle is under heavy use. When properly maintained, quality reels, such as those made by Penn, will continue to perform admirably for years and years. 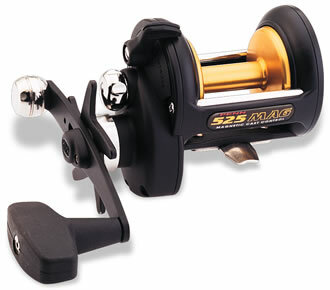 8) If you plan on overhauling your reel yourself, organization is extremely important. Select a level, uncluttered, well-lit work area. Keep your manual handy as a reference guide when disassembling and reassembling your reel. Arrange your tools, lube, grease rags, brushes, cleaners, etc. ahead of time, and prepare a place to put parts, sub-assemblies, etc. Many "do-it-yourselfers" arrange parts in the order they disassemble them, often placing parts in empty egg cartons or similar containers to avoid mix-ups. 9) Once a reel is disassembled, you will need to break the oil/grease down. Degreasing agents range from kerosene to mineral spirits to Simple Green, Dawn or other detergents. Remember to remove the degreaser before re-assembling and be aware of any hazardous or environmental consequences of using these degreasers. 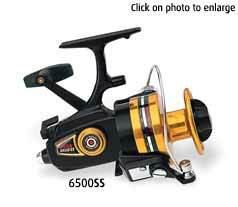 10) Most tackle manufacturers, such as Penn, also offer factory servicing and overhauling of their respective reels. Those anglers that prefer to have these services performed by factory-trained technicians can make arrangements to do so by contacting the company's customer service department. While periodic factory servicing is recommended, this is not meant to replace regular tackle maintenance practices after each trip. 11) Rods, of course, are simpler to maintain than reels, as there are few moving parts. Just remember to wash your rods off thoroughly with fresh water (and a mild soap if desired) after each trip to remove salt, scales and impurities. Also visually inspect your rod guides regularly for any nicks or cuts that could damage or fray your line. Another effective method to check for guide damage is to run a pair of women's stockings through the guides. The nylons will snag on any significant imperfections. When storing your rods, avoid leaning them against walls as this may cause the rods to bend and warp. Instead, store them vertically in a rod holder, or hang them horizontally, in a cool, dry location. 1) When you are through fishing and AFTER you rinse your reels with fresh water, back off your drag. This will take the pressure off the drag washers and give them longer life. 2) Your reel needs little oil. Loading your reel with oil can make the drag system less effective.